In preparation of this afternoon's game, I decided to make it a real game day by preparing some good ol' buffalo wings. We all love them, but it is a tad on the unhealthy side, so to try to make it as grease free as possible, I throw the wings into the oven instead of deep frying them like a lot of mainstream restaurants do. 3) Mix the hot sauce with the butter, lightly toss chicken in 1/3 mixture. 4) Cover up a cookie sheet with foil, lightly oil/spray it, layer chicken in a single layer and put it in the oven. 5) Cook for about 35 minutes, and then turn the oven to broil. Broil chicken for an extra 5 minutes, this helps give it that seared color you see in the picture. Beware, this step is not 100% necessary as your house might smoke up from the splattering of the oil - so watch this carefully and if you live in a tiny studio, you can potentially skip this step altogether. 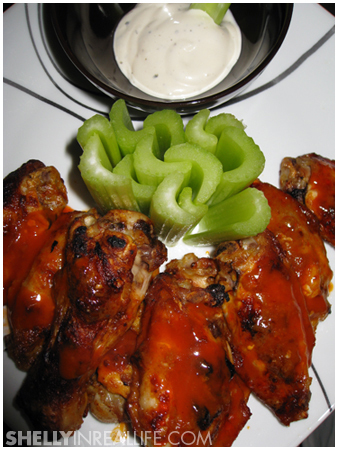 6) Toss wings with the rest of your hot sauce mixture (don't use the same mixture you toss your raw chicken in!!). Serve with ranch, celery and a nice cold beer. As you can see, this recipe is super easy. A lot of buffalo wings recipes I've seen calls for a 1:1 ratio of hot sauce and butter, but that's up to you. I really didn't miss it, but if you love butter, put some more. Enjoy!